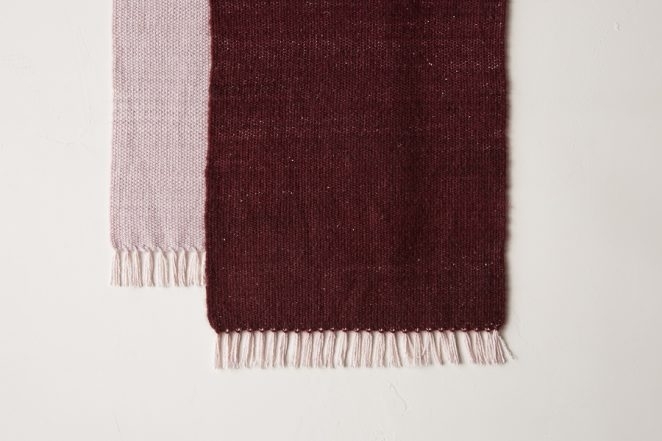 Using the most gorgeous cashmere we know, our Woven Cashmere Ombré Scarves explore compositions of gradually shifting values with an effect that is truly intriguing! 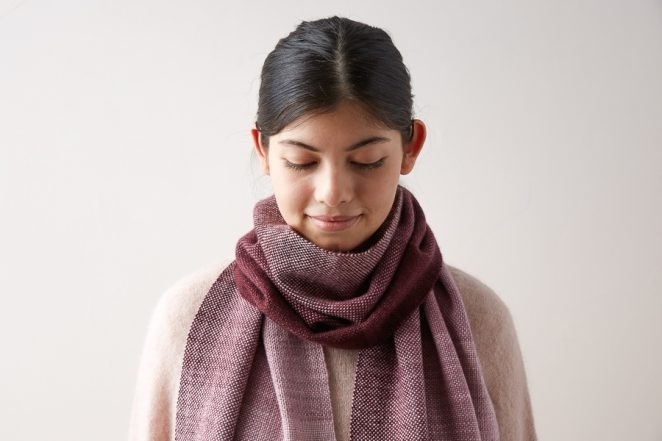 We made both scarves with the eight skeins of Jade Sapphire’s hand-dyed Mongolian cashmere that come in our Cashmere Ombré Wrap Kit. 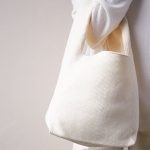 Originally designed for a knit wrap, this yarn is just as amazing woven! As always, our tool of choice is Schacht Spindle Co’s Cricket Loom, a super-simple rigid heddle loom that fits on a table and stows in a little box. 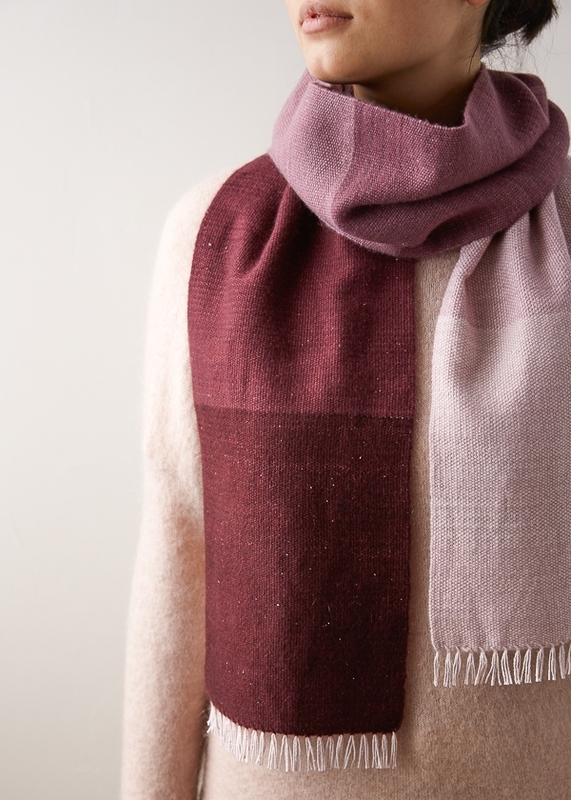 The first scarf we created is the Gradient Scarf. 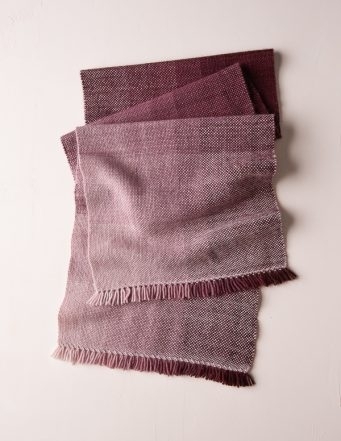 Soft and supple in a balanced plain weave, the warp moves through all eight colors, from light to dark, while the weft does the same but then shifts back again from dark to light. We could look at these plays of light and shadow all day! 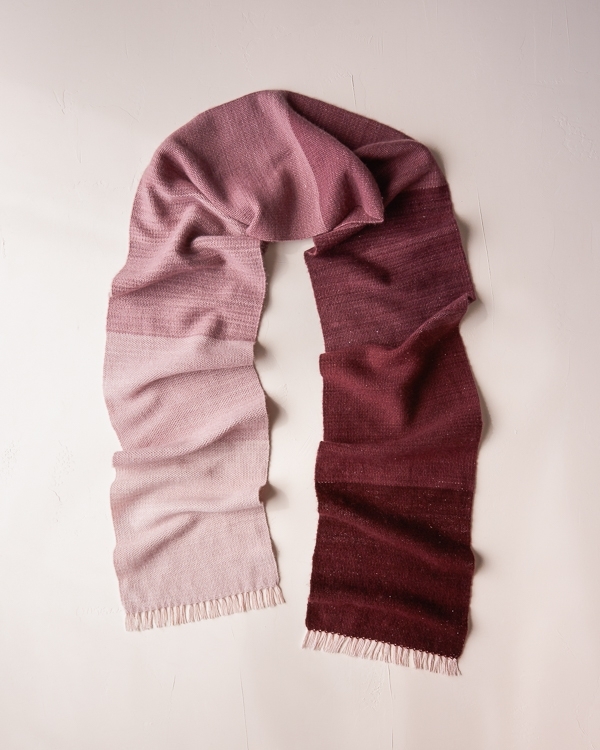 The second scarf, our Colorblock Scarf, puts the ombré on display with eight simple stripes. 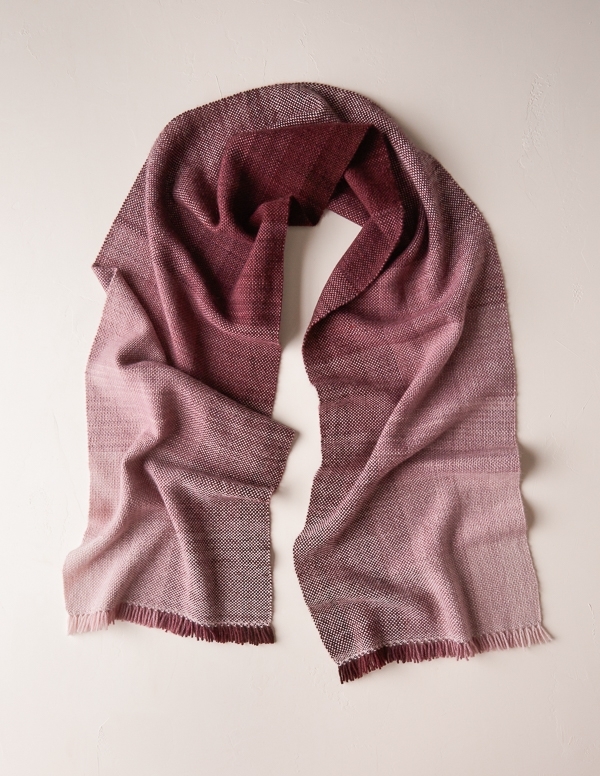 A bit denser than the other scarf, this one is in a weft-faced plain weave, using Cattail Silk for the warp. The Colorblock Scarf pays homage to the hand-dyed beauty of this yarn, allowing all of its subtleties and vicissitudes to shine! We made our scarves in the Cashmere Ombré Wrap Kit color Plum, a moody and mysterious world. Choose the same or check out all nine palettes, including the three newest members of our color family: Cypress, Robin’s Egg Blue, and Geranium. So much beauty! 8 skeins of Jade Sapphire’s 4-ply 100% Mongolian cashmere, hand dyed exclusively for Purl Soho. We used the color Plum. 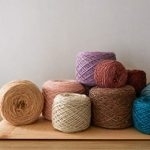 NOTE: This yarn is only available in our Cashmere Ombré Wrap Kit. This is enough yarn to make both the Gradient and Colorblock Scarves or to make 2 Colorblock Scarves. 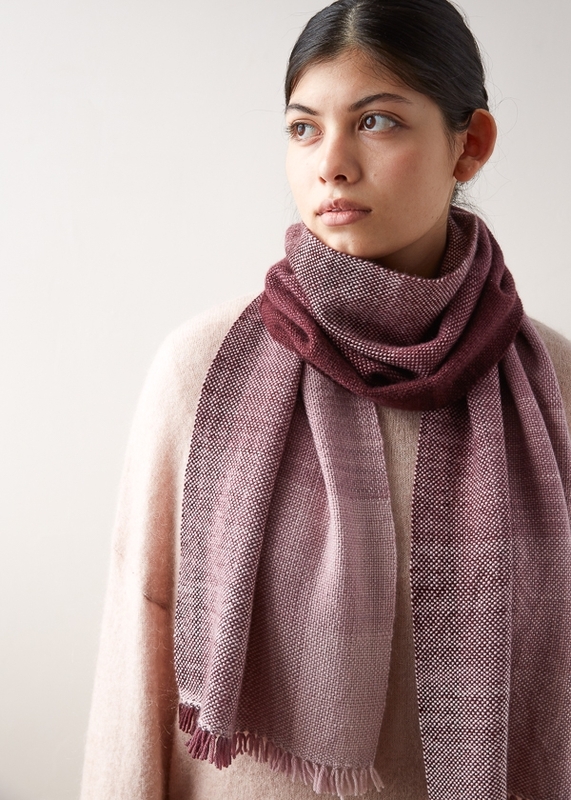 Warp Yarn for the Colorblock Scarf: 1 skein of Purl Soho’s Cattail Silk, 100% silk, in a light color that coordinates with your cashmere. We used Lavender Daybreak. 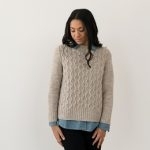 For both patterns, we will refer to the yarns in light-to-dark order, starting with Yarn A (the lightest color yarn) and ending with Yarn H (the darkest color yarn). NOTE: A Balanced Plain Weave means there are about the same number of Picks Per Inch (think “rows”) as there are Ends Per Inch (think “columns”). Set up the warping peg 110 inches from the front of the loom, which is at the front edge of the table. With a 10-dent reed in place and using Yarn A (see Notes), begin by pulling the first loop of yarn through the 3rd slat from the right end of the reed. Working from right to left, pull Yarn A through an additional 8 slats. You will have threaded 9 slats, giving you 18 warp ends. Cut Yarn A and tie it to the back apron rod. Tie Yarn B to the back apron bar and pull this yarn through the next 9 slats. Continue in this fashion, using Yarns C through H for each subsequent 9 slats. In the end, you will have a total of 72 slats threaded with 144 warp ends on the loom. Finish the warp according to the Cricket Loom instructions, transferring one strand from each slot to the hole to the right of it. Tie the warp onto the front apron bar. Now, wind one shuttle full with Yarn A and the other full shuttle with Yarn B. 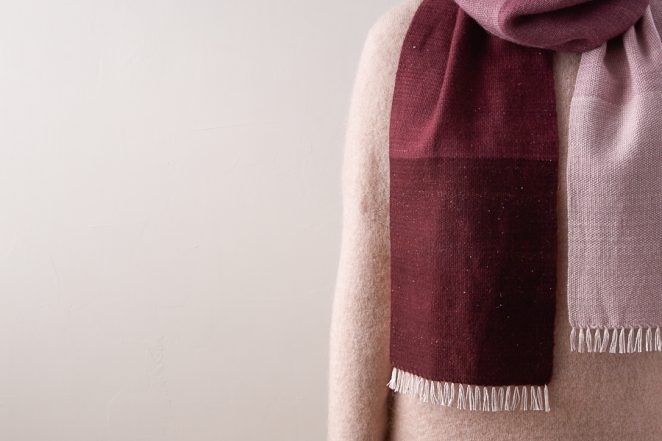 NOTE: If you’re making both scarf projects you will want to be sparing with your yardage. Each shuttle should be filled with approximately 7 grams of yarn, or wrapped 35 times for each stripe. Beginning with the reed in the up position, pass the Yarn A shuttle through the shed from left to right, leaving a 36-inch tail (which you will use at the end for finishing). Weave an additional 5 rows with Yarn A, making sure you beat each row with enough force to get the weft threads very tightly packed to create a secure selvedge. These 6 rows of Yarn A should measure about 3/8 of an inch. Then, continuing with Yarn A, weave for 5 inches until the Yarn A section (including the selvedge) measures 5 inches, now just lightly beating the weft down for a balanced plain weave. With Yarn B, weave for 5 inches. If you only have 2 shuttles, empty any remaining yarn on the shuttles and fill one with Yarn C and the other with Yarn D.
Continue weaving in this fashion, weaving Yarns C through H, from lightest to darkest, for 5 inches each. NOTE: Fill the shuttle for Yarn G with twice as much yarn as you did for the previous colors. With Yarn G, weave for 5 inches. Empty the shuttles and fill one with Yarn F and the other with Yarn E.
Continue weaving in this fashion, weaving Yarns F through A, from darkest to lightest, for 5 inches each. On the final stripe using Yarn A, beat the last 6 rows quite firmly to make a secure selvedge. 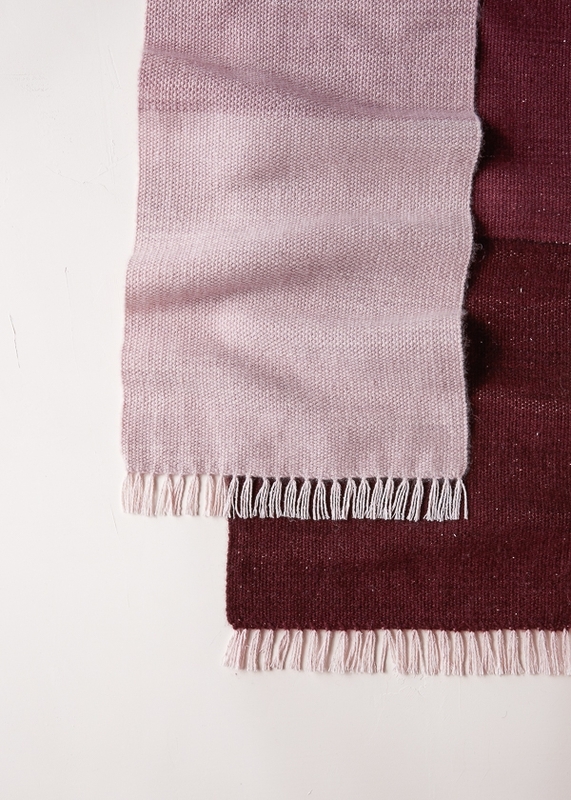 NOTE: For a complete how-to on this step, visit our Finishing with Hemstitch Tutorial. 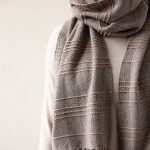 Making sure your warp is not under tension, make the Hemstitch around groups of 4 warp ends across the width of the scarf. Cut the fringe ¾ inch from the end of the weaving. 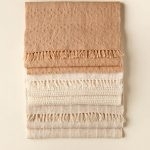 Weave in all the tails and gently hand wash your finished wrap in cold water, laying it flat to dry. 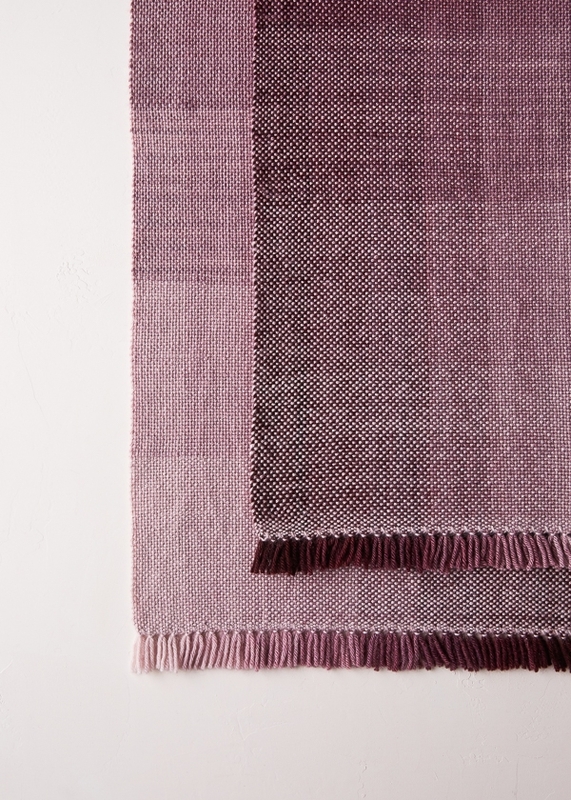 NOTE: A Weft Faced Plain Weave means there are more Picks Per Inch (think “rows”) than there are Ends Per Inch (think “columns”). With a 10-dent reed in place, and using the Warp Yarn (see Materials), begin by pulling the first loop of yarn through the 3rd slat from the right end of the reed. Working from right to left, pull the Warp Yarn through an additional 49 slats. You will have threaded a total of 50 slats, giving you 100 warp ends. Now, wind one shuttle full with Yarn A (see Notes) and the other full shuttle with Yarn B. 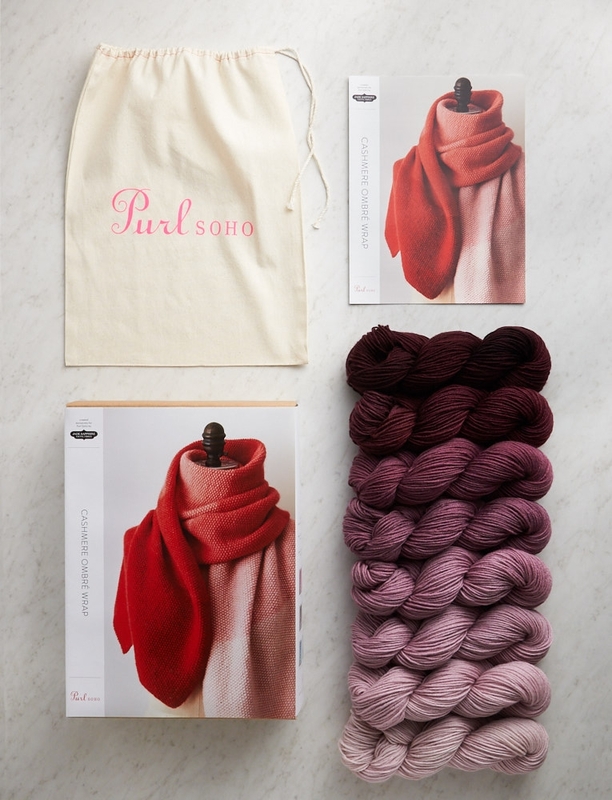 NOTE: If you’re making both scarf projects you will want to be sparing with your yardage. Each shuttle should be filled with approximately 20 grams of yarn, or wrapped approximately 110 times for each stripe. Weave with Yarn A for 10 inches. NOTE: When beating the weft, remember you are trying to get 24 picks (i.e. rows) per inch. 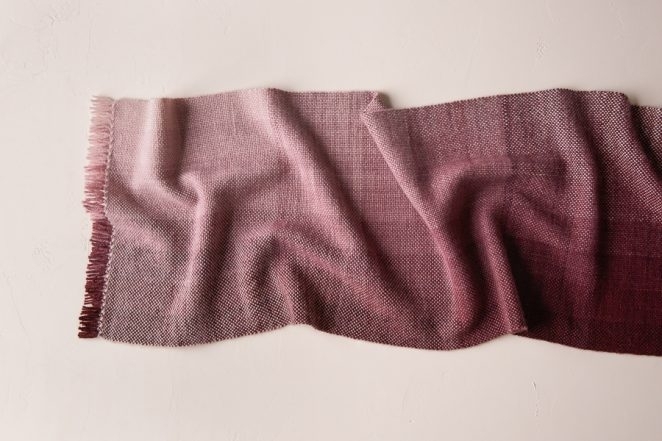 Because the warp threads are fairly widely spaced and the cashmere is naturally compactable, you should be able to easily achieve this weft-faced fabric without beating the reed too forcefully. With Yarn B, weave for 10 inches. If you only have 2 shuttles, empty them both and now fill one with Yarn C and the other with Yarn D.
Continue weaving in this fashion, weaving Yarns C through H, from lightest to darkest, for 10 inches each. Once you have woven a 10-inch stripe with all 8 colors, cut Yarn H, leaving a 36-inch tail for finishing. 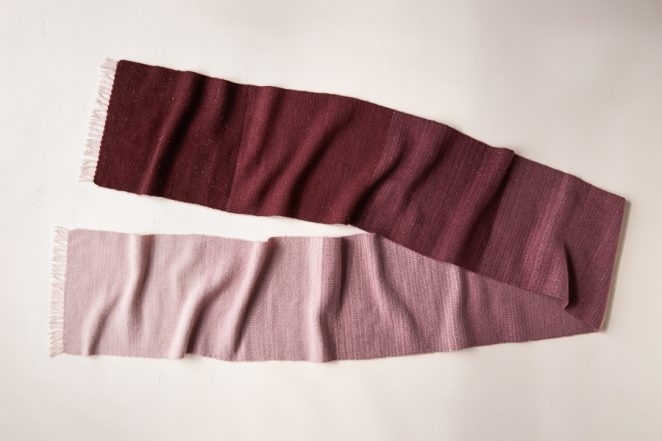 New Colors of Linen Quill! 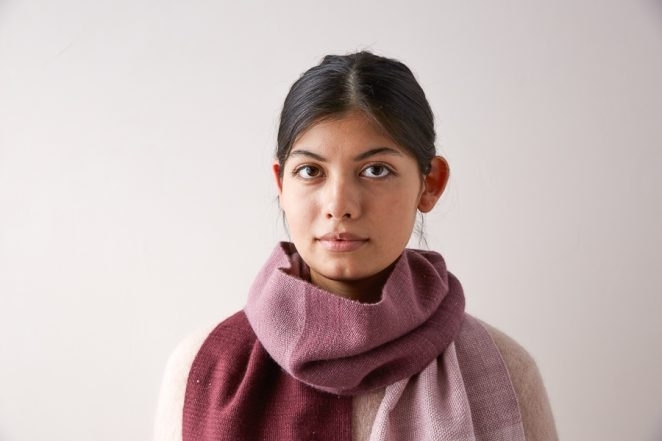 Hello—beautiful scarf! If I don’t own a 10-dent reed, can I weave this with a 12.5, or will that be too dense? Great question! 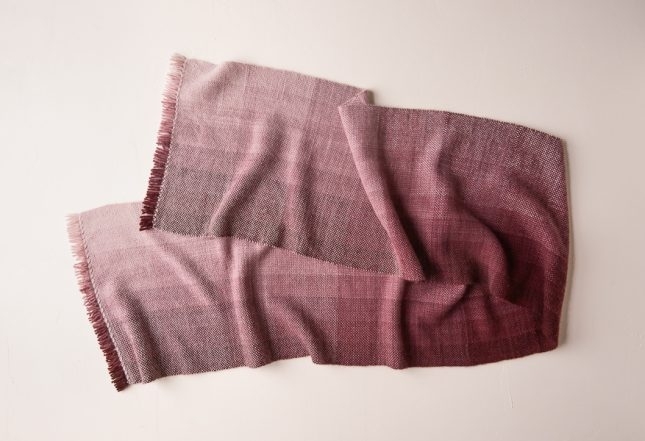 These lovely scarves are already woven a bit on the tight side. 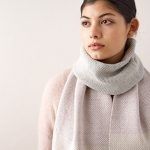 I think that with s 12.5 dent reed, the scarves may lack the drape that ours do and be quite tight indeed.